RANCHO SANTA MARGARITA, Calif., April 22 (SEND2PRESS NEWSWIRE) — Priceweaver, Inc., a secondary marketing-focused product and pricing provider, announced that it has moved its office to a larger facility. The relocation allows the company to grow and satisfy an increasing demand for its solution. Priceweaver’s new location doubles its space and provides a centralized location for employees to work and collaborate. The company’s new office will predominantly house additional technical staff to support new clients. * All contact information remains the same. Company officials at Priceweaver say they plan to announce a number of significant happenings in 2011. Founded in 2008 and headquartered in Rancho Santa Margarita, California, Priceweaver, Inc. offers a next-generation product and pricing engine (PPE), rate sheet automation and business rule configuration tool that is made available via the software-as-a-service (SaaS) delivery model. Through Priceweaver’s unique approach to product and pricing automation, the company engineered a highly flexible and contemporary Web-based platform that puts lenders in control of easily managing all business channels, loan programs, rate pages, profits, adjustments and guidelines. Priceweaver’s flagship product, LenderHub, is built from the inside out to provide newfound profitability management for use by secondary marketing professionals and other back-office staff. The company’s solution is utilized by lending organizations of all sizes. 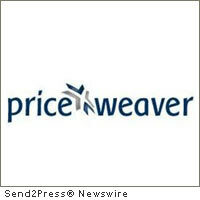 For more information, visit www.priceweaver.com or call (949) 35-GET-PW. News issued by: Priceweaver, Inc. Original Keywords: SaaS, Priceweaver Inc, secondary marketing, product and pricing engine, mark ramirez, loan programs, rate pages, profits, adjustments and guidelines, lenderhub Priceweaver, Inc. Rancho Santa Margarita California RANCHO SANTA MARGARITA, Calif.
RSS News Feed for Priceweaver, Inc.
REFERENCES: Banking News, SaaS, Priceweaver Inc, secondary marketing, product and pricing engine, mark ramirez, loan programs, rate pages, profits, adjustments and guidelines, lenderhub Priceweaver, Inc. Rancho Santa Margarita California RANCHO SANTA MARGARITA, Calif.